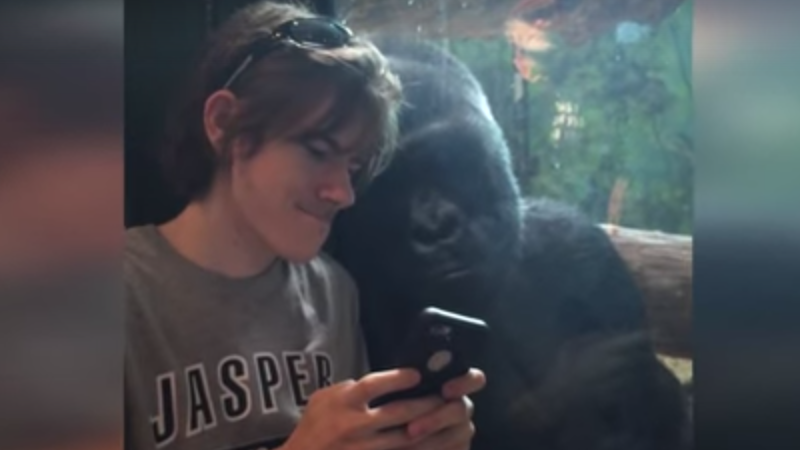 Jelani, an 18-year-old gorilla at the Louisville Zoo, is really into smartphones. A video was captured of a zoo visitor showing pictures to the primate. What exactly was on this young man’s phone that he was happily sharing with his chill gorilla bro? No nudes, but pictures of other gorillas, of course! Jelani, a Western Lowland Gorilla, is known for his deep appreciation for smartphone technology, Time reports. Jelani’s bio on the zoo’s website even reads, “He is a laid-back individual and likes to look at cellphone photos and videos.” Western Lowland Gorillas are described as critically endangered. Jelani resides in the zoo’s Gorilla Forest, a research center and sanctuary which is part of a four-acre habitat. A few months ago, everyone was going wild for that one hunky gorilla, but Jelani is just as cool. Plus, you could probably show him hundreds of your deleted selfies and he’d enjoy it.